Shelley Denise Scott - Edmonton's Burial & Cremation Professionals | Trinity Funeral Home Ltd.
We are mourning the unexpected loss of Shelley Denise Scott at the age of 57, on January 15, 2019. 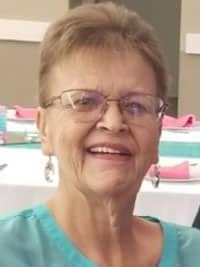 Shelley will be missed dearly by her husband David, her daughters Lindsay and Kelsie, her granddaughter Twyla, as well as many other family members and friends. She was more than a mother to her two daughters; she was a mother to anyone who came across her path. If you were a friend, you were also family. She was kind, caring, and willing to help anyone in need. Shelley loved playing with Twyla, and having friends and family over for backyard barbeques. Her heart and home were open to everyone. We will miss her laughter, her wonderful baking and cooking, and singing along with all the songs she knew. So sorry 😐 to hear of the loss of this lady 😞 condolences to the family. Thank you for always believing in me no matter wat trouble i was in or what I’d done. You and uncle dave have always invited and even insisted i come stay with yous. I wish i could go back and accept you’re last offer. If only i coild have known wed only be getting another 6mnths to share. I regret not coming. We’re family and we stick together youd always assure me with a big hug and tell me the doors always open anytime day or night just call we’ll come get you even. And ur laugh would would peirce through and no matter how down i was i couldnt help but smile. For one more hug one more bouncy chuckle hell even to hear1 more yeah it was stupid but its ok “we’re family and we stick it together”… i refused to believe in my heart your gone. But ill tell you lady you’ve worked hard enough and ill rest easy knowing ur among angels and tell grandpa not to eat all my macaroons. Dave lindsay and bug. Im sorry for her early departure. heaven mustve needed a real special angel. I am so sorry for your loss and to say good-bye to this remarkable lady. I have fond memories of Shelly from my growing years. Her infectious laugh, sweet sense of humour and her loving heart. She will be dearly missed.